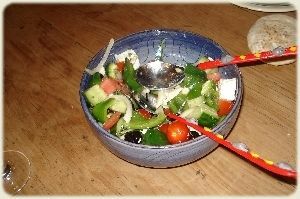 Greek Salad is more commonly known in Greece as a village, country or rustic salad (χωριάτικη σαλάτα). 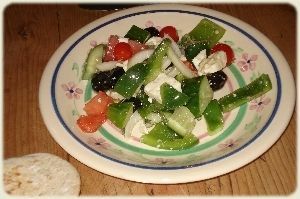 It is basically a combination of tomatoes, cucumber, onions, green pepper, olives and feta cheese with olive oil and oregano. It tends to be the staple diet for Mrs. S when we go to Greece, as she is a vegetarian, so souvlaki or meat balls don't go down too well. Back home, Mrs. S frequently rustles one up, even when we are not pretending we are in Greece. Here you can find out how Mrs. S does it. Wash and/or wipe the vegetables. Roughly chop the onion into chunks, could be circles or slices and place in the salad bowl. Chop cucumber, again into chunks. Add to bowl. Chop pepper into chunky strips and then divide into thirds. Add to bowl. Chop (or not if they are little ones) the tomato. Add to bowl. Add a few (or many) black olives. Add to bowl. Cut feta into cubes. 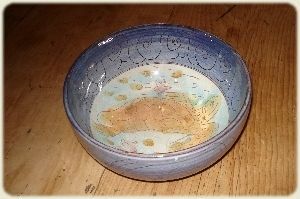 Add to bowl. Squish in some oregano leaves. 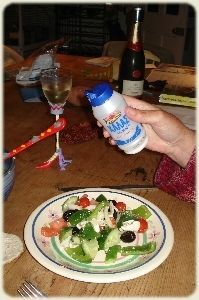 Stir the salad around so a good mix of things come to the top. Add seasoning or more onion or whatever as you wish. Mrs. S shows you how she made the latest salad, including picking tomatoes and oregano from our garden. 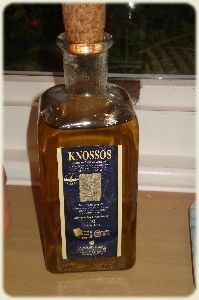 Crack open the ouzo, sit back and enjoy it. P.S. Contact us if you want some of our oregano plant! !